No monthly rentals on terminals, No lock-in contracts. You only pay for successful transactions at standard swipe rates. Run your business on-the-go. Accept cash and card transactions anywhere, anytime with all the features you need to sell on your iPad. Taxes extra. Additional service charge fee of Rs 10/- per day is charged if your monthly card transactions volume is less than Rs. 1,80,000/- per device. Shoptree Payments is designed to processes card transactions at blazing speeds anywhere anytime on your iPad even on 2G networks. No hassle of preserving the charge slips for 6 months, all transaction charge slips are digitally saved and can be printed when required. Customers mobile number receives instant sms notification on a successful or failed transaction including download link of charge slip. We are way more secure than your standard terminal. 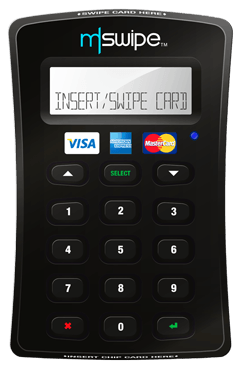 All card details are encrypted in the Wisepad hardware and meets all global card payment security standards like EMV Level 1 & Level 2 and PCI certified. No need to open a new bank account to start accepting card payments. Just provide us your existing bank account details and we will deposit money to that account. Accept all major debit and credit cards, including Visa, MasterCard, American Express, Maestro and Rupay right out of the box.